Focus... on the Long Term! In 2019, we are pulled between two trends that are a bit antagonistic! Between delirious enthusiasm, very optimistic (unrealistic) forecasts, whimsical propositions, excesses of all kinds, and certain celestial injunctions that invite us to expressly follow the path of reason, we will have to choose! Jupiter, Saturn and Neptune will play a curious part and score in 2019 and if Jupiter tends to increase the idealistic expression of Neptune, not sure yet that this giant of the zodiac is pointing us in the right direction. So let us be wary of any overestimation of our powers and of any objective that is disconnected from reality and could lead us to chaos or at least ... to confusion around mid-January (the 13th), mid-June (the 16th) and the end of September (the 21st)! A denial of responsibility, lucidity at half-mast, a tendency to deceit, wanting to take off without a belt, and social unrest? With a bonus risk of discovery of abuse (financial, political, ideological, and so on ...)! 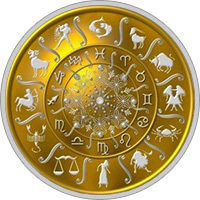 It should be noted, however, that the tension between Jupiter and Neptune will not only have deleterious effects, but this dynamic could exalt certain humanistic, philosophical, and spiritual projects that could considerably elevate the debates. In fact, everything will be a question of measurement! So let's count on the second cosmic actor on our paths in 2019 to temper our ardor and our big and small delusions but especially to help us pass from smoky dreams to constructive realities that are no less meaningless. Saturn will attempt to bring Neptune (and us at the same time) back down to earth around January 31st, June 18th, and November 9th, when this "great teacher" of the zodiac will try to correct the excess of zeal and other uncontrolled impulses of Jupiter! To predict? A fight between our desire to push the boundaries of the possible and the art and way of how to do it without exceeding the limits! An inevitable tension between confused ideals and austere measures. We must try to anchor what can be in solid basis and maintain the course ... for the long run! It will therefore, in 2019, be for us to go from adolescence to middle age, crazy expectations to reasonable advances that are concerned with the good of everyone! Routes that we could definitely take from mid-December 2019! Waiting for 2020 when our current choices should finally allow us to complete a necessary metamorphosis, whether personal, societal and/or ideological!